Having transformed earlier wood constructions into more durable stone or marble, the Greeks continued in their path towards aesthetic perfection. Most historians claim they achieved that perfection here in the Parthenon. 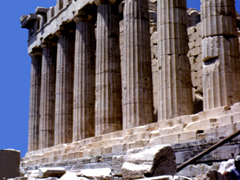 The Golden Age of Pericles brought us the Acropolis. The sculptor Pheidias served as advisor to Pericles, and the Parthenon itself was designed first by Kallihrates in 475 B.C.E., and in 447, Ictinus was appointed by Pericles to complete the work. The temple was dedicated to the goddess Athena, who had won the hearts of the people (mythologically speaking) by producing an olive tree from a spring running through the Acropolis; her competitor, Poseidon, had created a horse out of that same water. While Poseidon's feat was spectacular, invoking all the majesty and strength of the horse, olive trees have always had a special sense of faith about them. It apparently takes time for the tree to bear fruit, and so it is a matter of faith to plant such a thing; so, too, was the symbolism inherent in Athena's feat. The dedication seems to have been held in 432 B.C.E. Athena, of course, like all good goddesses, was a virgin, and the Greek word for that state is "parthenos," and thus we have the Parthenon. Beginning with the ancient megaron, a structure incorporating porch, vestibule, and internal hall, the culmination rests on the Acropolis in Athens. 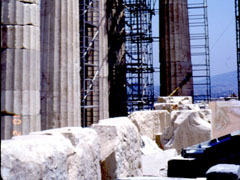 As viewed from the entrance of the Propylaea to its west, the Parthenon appears almost as if perched on its pedestal. Of course it's missing its roof and most if its interior walls, possibly thanks to a Venetian shell striking Turkish ammunitions stored inside in 1687, but it seems as if the building would have soared off of its perch regardless of that calamity. Such is its repose, serenity, lightness of structure, and elegant grandeur. It is a refined architecturally-evolved species of design. Bear in mind that this is not the entrance to the Parthenon - that was traditionally on the east and we would have to traverse the Acropolis to get to the far side to enter. 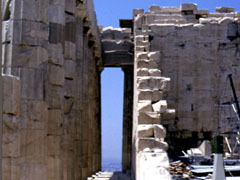 It was that passage, that ambulatory necessity that made the grounds of the Acropolis quite exceptional, planning-wise. The top of the base measures 31 meters (101'-3 3/4 inches) in width, and its length is 70.2 meters (228'-0 1/8” ). 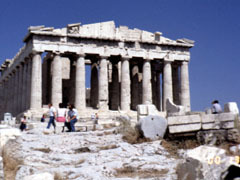 The north side of the Parthenon. Alternating triglyphs and metopes appear at the roofline. Many of the metopes are gone, literally ripped off and taken to museums in other parts of the world. The Doric Order manifests itself, of course. The fluted columns were created, perhaps for decorative purposes, and to provide a slimming effect, as well as shade and shadow. Notice the drum sections of the shafts, which are also “swelling” (entasis), which give them an inner pulsating life, as they taper out then in again towards the capitals. Everything is in motion. The columns radiate outwards from the center (there are 17 columns on the long sides, 8 in front and back). The stylobate (base) has an upward camber on both the long and short sides, as do the architraves (beams), that offsets an optical feeling of sagging, which would have resulted had they not had this camber. 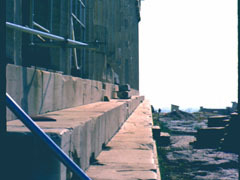 Thus the peripteral (freestanding) columns appear to be on a level platform; there has been an optical correction, and this was a major sophistication in design and construction. Sighting down the long (north) side we can actually see that upward camber. Details of the columns. There were so many prescriptions for design that even the shape of the fluting was differentiated among the 3 orders. Here we can see elliptical recesses, while the Ionic and Corinthian were required to have semi-circular cuts. 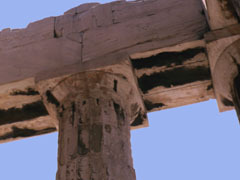 The abacus and echinus, which comprise the capital and act as brackets to reduce the span between columns. Post and lintel were used, of course. The Greeks were very conservative designers, and over a period of about 2 centuries managed to reduce and refine these capitals from earlier bulging pillow-like effects, as at Paestum. 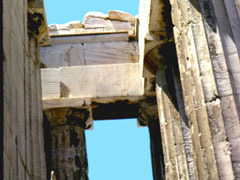 A detail of the architrave connecting across the columns. The peripteral columns are to the right, the walls of the naos (inner chamber) on the left. Another view shows the position of the naos, this time on the right. 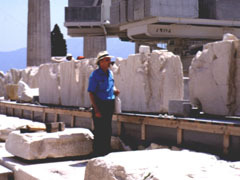 All of the marble was originally pure white pantellic. Pollution has taken its toll; so, too, of course, has time. 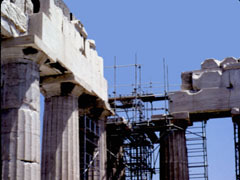 A lot of harm was done in misguided attempts to hold the Acropolis and its buildings together about 100 years ago. Metal was used to clamp parts to each other. The metal rusted, expanded, broke connections, and caused more damage than it had repaired. New reconstruction began in about 1985, and this photo was taken in 1987. It had taken 3 years of letter writing to finally obtain permission to enter the then closed-to-the-public interior of the Parthenon. The crane in the background was a specially designed French machine, which minimized visual obstruction. 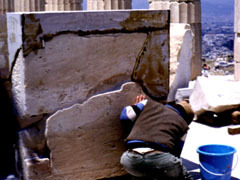 The parabolic-shaped construction tent inside the Parthenon was part of this most recent restoration; this photo was taken in 1987. 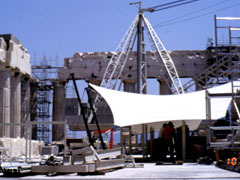 The tent was used both for a sun shield, as well as to protect delicate work being done on site. Titanium rods were being used in this recent reconstruction - they do not rust and have about the smallest coefficient of expansion/contraction of any metal. Titanium is, therefore, very expensive, but the present reconstruction should endure. The fitting together of pieces – a more-than-painstaking process. One of my students, Jacqueline Gonzalez, who will remember that day for the rest of her life. She went on to become an Architect. 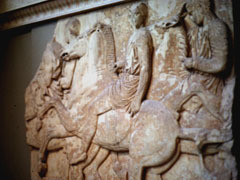 These relief sculptures are from the frieze inside the walls of the Parthenon and have been placed on exhibit in the museum on the Acropolis. They depict Olympian gods attending the Panathenaic procession. While the Greeks portrayed their ideals of face and figure, they never-the-less created extraordinarily realistic representations of human and animal figures. There is an underlying power in the figures of the horses, perhaps acting as counterpoint to the serenity of the gods, as part of the Greek attention to drama. The statue of Athena, designed and built specifically to be the focal point of this temple, was somewhere between 12.3 – 13.0 meters high (40' - 42') and created in gold and ivory. The term for such a creation is “chryselephantine.” The statue was created by the sculptor Pheidias (mentioned above as advisor to Pericles), and was dedicated in 438 B.C.E. The statue was supposedly made with a wooden armature that supported the ivory skin and golden drapery. All traces of Athena have disappeared completely.